The new SAPPHIRE R9 290X Tri-X 4GB OC features the latest GCN (graphics core next) architecture from AMD with 2816 stream processing units and an enhanced engine clock of up to 1020Mhz. 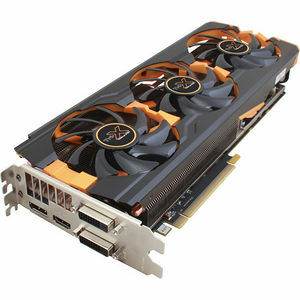 It is equipped with 4GB of the latest high performance GDDR5 memory on a 512-bit interface and now clocked at 1350 MHz (5.4GHz effective) delivering higher bandwidth than earlier models.The new SAPPHIRE R9 290X Tri-X 4GB OC is built on a SAPPHIRE original pcb design with the power upgraded to a 6-phase VDDC power design. Two 8-pin power connectors ensure adequate system power is available (up to 375 Watts total including PCI-Express power). 2X150 Watt 8-pin PCI Express power connector is required. 4X150 Watt 8-pin PCI Express power connector is required for CrossFireX system.